Cover Story: Cervia Belissima! 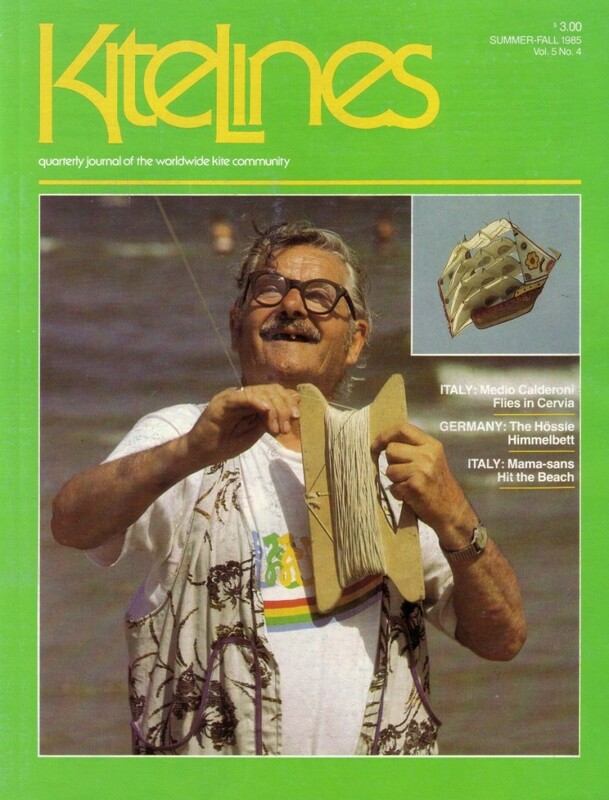 Cervia Volante ’85, by Valerie Govig on with cover photos by Jacques Fissier of Medio Calderoni and his ship kite, plus a report from Oliviero Olivieri on Italy’s kite renaissance. Features: The Mama-sans invade Europe, by Valerie Govig; a kite club update. Departments: Letter from the Publisher: a thank-you for Club Cervia Volante; What’s New: Kites: the nylon Trlby, the Starflake and Asteroid from Suspended Elevations and the Hawaiian 16 stunter; What’s New: Books: CerfsVolants (Kites) by Picon; What’s New: Sundries: the Shanti Sky Claw dual line system; Design Workshop: Alex Dunton’s Delta-Box, with thanks to originator Hod Taylor; Kitechnology: Douglas Engh on splitting bamboo for kites; For the Record: Dave Town’s shoes-only beach skiing behind a Flexifoil stack and an update on Guinness records, with a Kite Lines proposal; Empty Spaces in the Sky: Lawrence J. Denmire; Shopping Around: Lou Kane on expensive kites and Netherlands shops, and Felix Cartagena on non-kite items in kite stores; Best Of Show: Erhard Hössle’s Number Seven kite train, photo by Ernst Jünger. Medio Calderoni of Ravenna, Italy flies some of his kites at Cervia Volante ’85 . The kite on the cover is one of two ship kites he lofts today . We also enjoy his circular-box centipede, his birds, boxes, airplane kites-all made by “feel” : Medio builds nothing.